Just like every year, there will surely be long lines in front of your local Walmart, Best Buy and Macy’s on Black Friday in two weeks (assuming you live in the U.S.). With the shopping season about to start in full force, Google is launching an update to its Google Shopper mobile app for iOS and Android to help consumers find that one cashmere sweater they’ve always wanted to give to their loved ones. 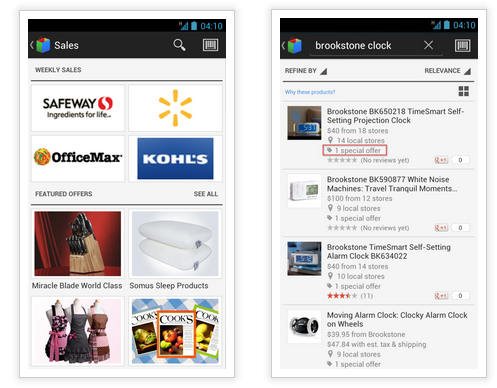 If you’re looking for a good deal on that moving alarm clock from Brookstone, Google Shopper now also makes it easier to find sales thanks to the introduction of the aptly named ‘Sales’ page. This page will show you deals from nearby stores’ weekly circulars and show you store promotions like 30 percent off deals and free shipping offers. With this update, Google is also integrating ratings from GoodGuide, so if you are not sure how healthy, safe and environmentally friendly a given product is, Google Shopper can now help you put your mind at ease by showing you GoodGuide’s scores.